If you’ve got a vinyl collection you’d like to digitize, there are several ways to go about doing so, but purchasing a USB turntable is probably the easiest. 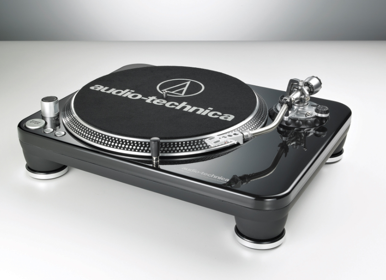 While most USB turntables tend to lack the quality components that provide great sound, Audio-Technica’s new AT-LP240-USB Direct-Drive Turntable aims to offer the best of both worlds by providing the convenience of USB without without compromising on quality. If you own a standard record player, the task of getting your vinyls onto a high quality digital format can be an involved process that requires relatively pricey outboard gear. The appeal of a USB turntable is that it automatically converts the record’s analog signal into a digital one, which your computer can easily receive via USB. The AT-LP240-USB uses a direct-drive, high-torque multi-pole motor that provides speed stability, and an S-shaped tone arm with adjustable tracking force and anti-skate adjustment and a removable cartridge mount. It plays back 33-1/3, 45, and 78 RPM records, and features a built-in phono preamp that allows it to be connected to a variety of music and home entertainment systems, powered speakers, and A/V receivers that don’t include a dedicated phono input. Since you’ll need software to convert your vinyls to digital format, the AT-LP240-USB includes PC and Mac-compatible Audacity software that lets you convert your records to MP3, WAV, and other formats. Such quality and convenience comes at a price, however, and the AT-LP240-USB carries an MSRP of $499.